Eternal Sunday: 09/ 2017 New release: Canal Pop feat. Arabescos – How Can You Expect To Be Taken Seriously? 09/ 2017 New release: Canal Pop feat. Arabescos – How Can You Expect To Be Taken Seriously? Eternal Sunday presents Canal Pop‘s new single, a cover of the Pet Shop Boys classic “How Can You Expect To Be Taken Seriously?”. The track was featured in 2016 in the compilation Prism, a tribute to Pet Shop Boys released by the German music portal Electrozombies (containing songs performed by some of the best artists in the electropop/ synthpop/ synthwave international underground scene like Parralox, Junksista, Machinista, Technique, etc.). How Can You Expect To Be Taken Seriously? 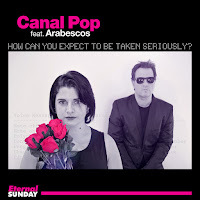 is Canal Pop’s first collaboration with singer Arabescos. The single features the single version that appeared in the compilation and a killer remix by German Kreff. Preview Canal Pop feat. Arabescos – How Can You Expect To Be Taken Seriously?